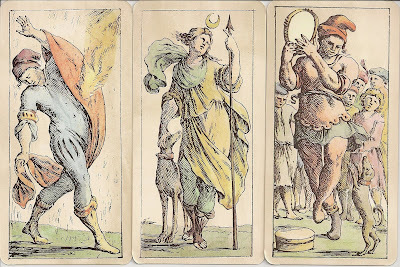 In the XVI century a reduction of the Bolognese deck was made that brought the total number of the cards to 62, with the elimination of the numeral cards from 2 to 5 in every suit, originating the so - called Tarocchino (Small Tarot) deck. The oldest complete conserved example of Tarocchino cards belongs to the XVIII century, when the famous engraver Giuseppe Maria Mitelli created a deck between 1663 and 1669 for the Bentivoglio family. The Majors do not feature the subjects name and the numbers too are omitted. The first trump is quite different from what the Conjurer usually looks like: it features a street artist performing with a dog, surrounded by children. 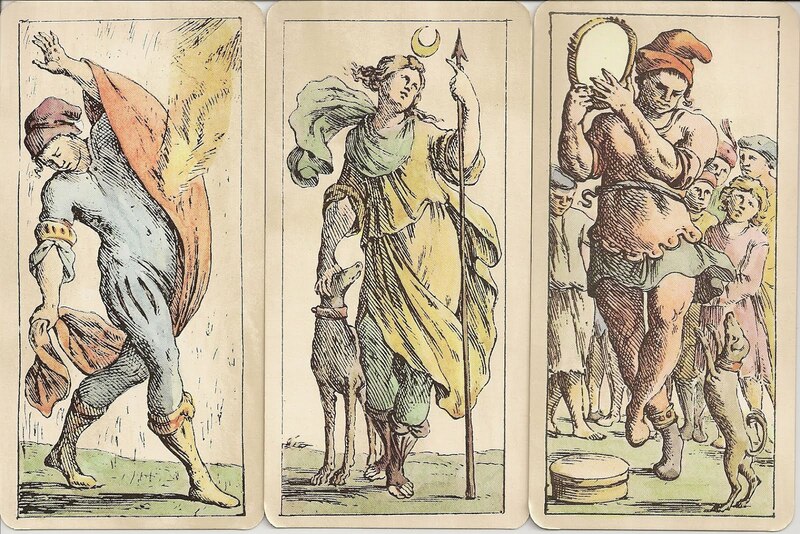 But in all tarots, including the Marseille pattern, the Magician is actually a performer of trivial acts (i.e. not a wizard, as the English name might wrongly suggest), so the difference in Mitelli's Magician is mainly graphic, without any real difference from the subject's original meaning. The next four cards usually called the Popess, Empress, Emperor, and Pope are here called simply "Papi", and all are of equal value. Later, after the papal ban upon that name in 1725, they where renamed to the "Moors". Two of them have imperial not papal crowns and a globus cruciger, they are the emperor of west and the emperor of east. Mitelli's sixth allegory "Love" is not the loving couple as in Marseilles decks but represented by a blindfolded Cupid with bow and arrows raising, with his left hand, a burning heart, according to an iconographical tradition of the Renaissance. The "Chariot" depictes a woman who holds reins tied to two birds, the three virtues (Temperance, Justice, Strength) are not split up like in other orders, but are together right after the Chariot. Strength is featured as a female figure embracing a column, in this differing from the corresponding allegory of the tarot of Marseille, usually portrayed in the attitude of opening the jaws of a lion. "Fortune" is represented by a naked girl who sits on a wheel with her right arm up and in her hand a bag from which coins fall down. 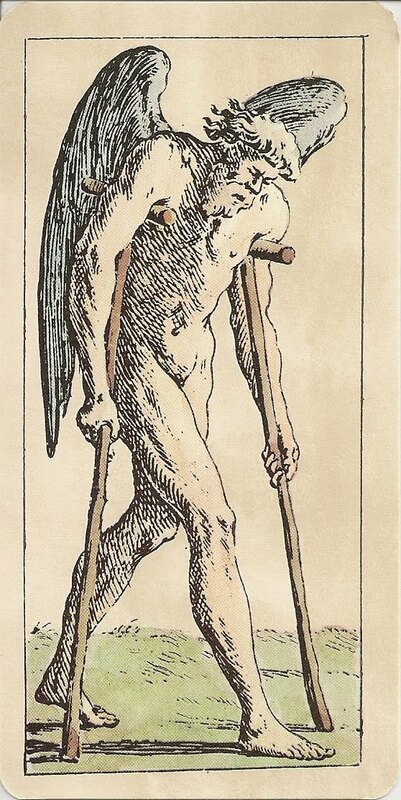 The next card, the old winged man helping his faltering pace with crouches is an allegory of Time, also known as the Old Man, which in tarots belonging to Dummett's group C (i.e. Marseille ) was replaced with the Hermit, probably around the 16th century. Mitelli's graphic interpretation blends the two original names. In modern editions of the tarot of Bologna, "Time" never really turned into a "Hermit", except for its name: the allegory still featured today is that of an old man with wings on his back, in front of a column, although the subject is now double-headed, and bears number 11. In Bologna's tarot, the thirteenth trump features the Traitor, which corresponds to the Hanged Man of the tarot of Marseille. Since the 15th century, the tarots used in north-eastern Italy (not only in Bologna, but in Ferrara and Venice too, i.e. the eastern group, or Dummett's B pattern) used to include the Traitor among their trumps. The "Hanged Man-Traitor" shows us a man beating a sleeping person on his shoulder with a great hammer, evidently recalling the biblical tale of Cain and Abel. Death and the Devil are not very different from other tarot decks. In most tarots, the sixteenth trump is the Tower, whose subject is a reinterpretation of an older one, called Fire, or Lightning; the well-known allegory of a tower stricken from the sky and catching fire is clearly related to the obsolete trump. In Mitelli's deck, this subject is still Lightning, which does not strike a building, nor a tree (as in the French Vieville's Tarot variant), but a human figure, who reacts to the thunderbolt by lifting his cloak as a shelter. Therefore, this subject was probably still alive in 17th century Bologna, although in modern tarots the name of this trump has changed into a standardized the Tower. The Star features a traveller with a lamp (similar to the one usually carried by the Hermit) walking at night-time under a starry sky. The moon is represented by the goddes Diana, the sun by Apollo. In the "World" there is Atlas and "Judgement" features a flying angel with a trumpet, the name of this subject in modern tarots of Bologna has remained the Angel. The edition published in 1978 by Graphica Gutenberg has a light watercoloring added to the images. 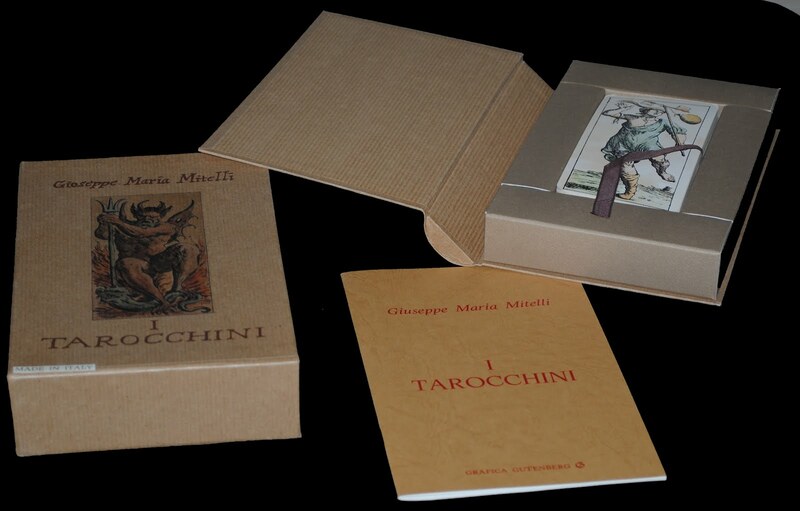 The explanatory booklet is in Italian only and the deck is housed in large hardcover, bookspine box.